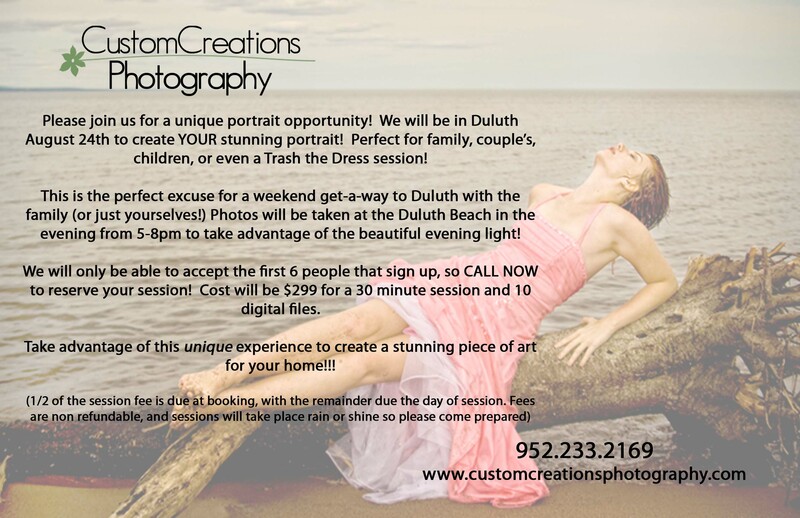 We will be in Duluth on August 24th to photograph YOUR unique portrait with the beautiful Duluth Beach scene. This is the perfect opportunity for a stunning family portrait, or even children, couple’s, high school seniors, or Trash the Dress sessions. The sky really is the limit! We will be accepting the first SIX people to book, as space is super limited. Sessions will be from 5-8 pm. to take advantage of the beautiful evening light!! For only $299 you will receive a 30 minute session and 10 digital files from your session. 1/2 down is due at booking, with the remainder due at the session. Fees are non refundable and sessions will take place rain or shine, so come prepared!